You are here: Home / Bread baking tips / A baker’s dozen: Our 12 plus 1 best baking tips! Baking is an exact science and measuring with cups and spoons can lead you to diverge by as much as 10 to 20%. So, how can you not invest in a kitchen scale! You can get them for the same price as a 10 kg bag of flour (come on, you do have kitchen appliances that are way pricier that you never use) and with great artisan bakers all over the world leading by example, you just need to jump on board if you want to get consistently great baking results. Take one recipe you like and stick with it for a while. First make the recipe as described, practice, adjust and fine tune it until it is completely to your liking and you can dream it. This way you will learn much more and more quickly than by constantly jumping from one recipe to the next. Buy a dedicated bread notebook (the old version, made of paper) and write down the exact amounts, dates, times and temperatures (room, oven, water and dough) each time you bake. Do write your notes down while you go, do not bet on the fact you think you will remember them the next time you bake, because you probably will not. If possible use a digital thermometer to measure the temperature of your water and dough. Make notes on results and next time improvements. Keep score of what works and what doesn’t. Yes it matters! Quality and freshness of products and especially the quality of flour will have a big impact on your baking result. It will give you better taste, texture, appearance and nutritional value. 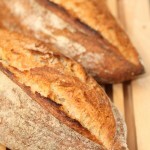 Check out our experiments on the subject of quality bread flour. 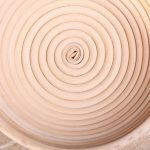 Let time and techniques like autolyse and stretching and folding help you with the development of your dough. The right temperature is the single most critical variable in baking. If possible use a digital thermometer to measure water and dough. A few degrees difference in dough temperature can change the duration of the bulk fermentation or the final proofing a lot. As a rule, we aim for a dough temperature around 24ºC / 75ºF and our recipes proofing times are based on this. More info and tips on this subject here. How accurate does your oven indicate the temperature? It is very important to adjust the temperatures given in any recipe to the working and dimensions of your oven. Good baking results depend on it. The same can be said for the introduction of steam, it will allow the dough to expand during the first stages of the baking process. Read more on how to make the most of your oven. Scoring dough can be tricky and you need to practice it a lot to get the hang of it, but it’s also part of the fun, especially as you find yourself getting better at it. Make sure your blade or knife is very sharp and make swift and confident slashes, but at the same time be gentle (iron hand in velvet glove). More tips on scoring. Get to know more about the how and why of your dough, working of yeast and properties of ingredients to understand the effects of time, temperature, liquid and types of flour used. Buy a good baking book that teaches you some basic bread science. Get used to the sticky! Working with high hydration doughs can be difficult. But please don’t spoil it by adding tons of flour until you think you can handle the dough. Do not start out with the stickiest of dough recipes. Get comfortable with a slightly sticky dough first and take it from there. And check out our tips on the subject. Time and timing are everything to a baker. Giving the dough enough time means better taste and texture for your loaves. Getting the timing right and proofing your loaf to perfection, so it will get that nice oven spring, is also something that needs practice and constant attention. So make sure to give your bread undivided time and attention, making sure there are no distractions and errands to run while baking. The baking experience will be much more relaxed and the results better! 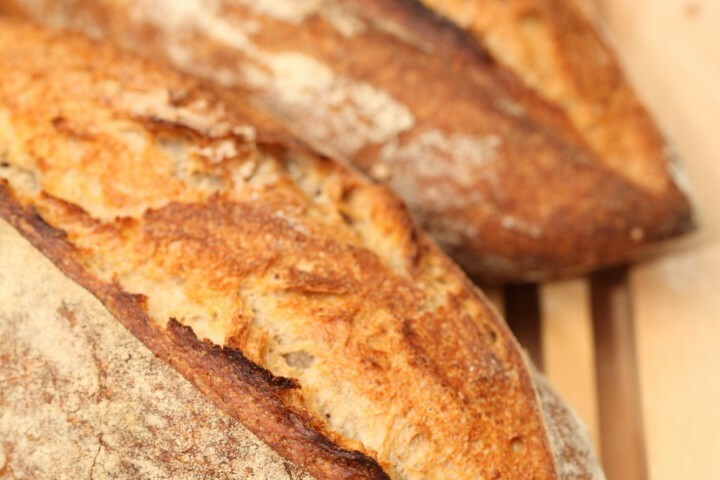 Do not be discouraged if your first bake is not perfect, especially with sourdough bread. This is all perfectly normal. 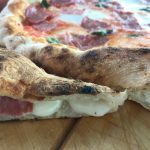 Like with all baking you need to learn to understand your dough and its quirks in combination with your surroundings, your material and ingredients. There are lots of factors that need to come together. In the meantime, your not so perfect looking loaf will very probably still be very edible and even better than anything store bought. And there’s no substitute for practice! +1 Pass on your baking skills! Learning how to bake your own bread is a skill for life. Next to sharing home baked bread, it is also much fun and very rewarding to pass on your own baking skills to others. Get family members, friends, the next generation or people who need or want to be (more) self sufficient enthusiastic about making their own real bread. Because there are so many reasons why home baking is best! There are a few theories for why a baker’s dozen is 13 instead of 12. The most common one is that it is widely believed that this phrase originated from the practice of medieval English bakers giving an extra loaf when selling a dozen in order to avoid being penalized for selling short weight. Any baker caught selling less than an even dozen was strictly and harshly punished. As a result bakers began adding one extra loaf to be certain their count would be correct or even over the amount decreed by law. Wat een openbaring deze website! Dankzij een workshop, zuurdesem brood bakken, deze website ontdekt. Tonnen nuttige info al gelezen, bedankt daarvoor. Klein vraagje, ook ik bezit een Rofco oven met drie etages, hoe schuiven jullie de broden en stokbroden van de plank op de ovensteen zonder de broden veel te beschadigen? Alvast bedankt en doe zo verder! Dank voor je enthousiaste bericht! Daar zijn we blij mee natuurlijk. Leuk te lezen dat je ook een Rofco hebt. Je hebt vast al onze tips gezien voor steenoven-bakkers?! Naast het schietplankje zie je ook een baguette schietplankje (extra lang en smal) dat gebruikt wordt om baguettes van werkbank naar rijsdoek en van rijsdoek naar de oven te brengen. Op deze manier, met de hulp van een beetje semolina of maismeel bv op de plankjes die fungeren als een soort kogeltjes, schuif je het brood de oven in zonder het te beschadigen. Als je handig bent kun je zelf ook plankjes maken. Hopelijk helpt dit je een beetje de goede kant op ?! Thanks for finding it useful Joseph. I did want to ask what you recommend to overcome this – I just knead for longer than the time in your recipe, but often my dough remains pretty wet (it doesn’t affect the rise or the taste) but it means I can’t shape it. It is really hard to judge how long you need to knead by hand, without seeing someone’s technique. As a rule of thumb you start by kneading for around double the time giving for kneading with a machine. 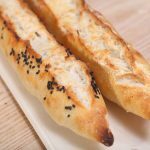 A lot of our recipes use short kneading times plus stretching and folding of the dough with longer resting times in between to develop the dough. Another important fact is the flour you, the protein content of it (for bread make sure you use strong bread flour with at least 12% protein to get good development) and the absorption of the flour (which can differ from ours). If you say the dough remains pretty wet the first thing to try is use a bit less liquid (few%) next time and see how that goes. Make sure the dough is well developed and when in doubt about this give it an extra stretch and fold and extra time to develop. Discovered your site while in process of making a version of Xavier Barriga’s bread – using his technique. Well, I needed to know what the measurements converted to for me and came upon your expert baking conversion table (www.weekendbakery.com/cooki…nversions/) and decided to explore your site more. I will be referring back to your site over and over again – and will be trying your recipes. I knew I needed a scale (from watching numerous baking shows) and have it on my list to purchase. . . . I used to bake bread once a week – of some sort bagels, french, loaf, etc. – back in the 80’s when I lived in Honolulu. Don’t know why I stopped even though I continued to bake other things. . . So now I’m back to baking bread. Thank you for your tips. Now to add the journal to my list and actually use it. I already have a digital thermometer. Thank you so much for sharing your thought and experiences. So good the scales are on the list, we cannot do without and are always encouraging people to please use them whenever possible (also to weigh their liquids / water). Seems you never lost your joy of baking and now again discovered the bliss of bread baking. We are sure, with scales, journal and thermometer and your earlier experience you are on the road to excellence. Wishing you lots of loaves and many happy baking hours! Excellent info!!! Novice here so much appreciated! Thank you. If you incorporate these tips one by one in your baking you will get good results we are sure. Grerat Site by the way, I have already made a Pain Natural and look forward to making many more of your breads etc. Thank you very much, I only found your site by accident. Thank you John, for your kind words and additional information. It is a bit a play on the theme of course – Our 13 tips. I’ve always wondered what is the best way to store bread? I notice the crust seems to soften overnight when I store it in a plastic container. Any other ideas? Depending on the type of bread and the amount of moisture still present in the crumb, any bread will soften at some point. That is why baguettes for instance are baked several times a day in France. Moisture travels from the inside of the loaf to the crust and makes it go soft. If a bread contains (too) much moisture after baking and /or is put in a plastic bag still a bit warm for instance, the crust will definitely go soft quick. But overnight this will definitely happen to any bread, in fact it will already happen within hours. So the best thing to do is give your baked bread a quick turn in a moderate hot oven , 5 to 8 minutes and it will be crusty again. Gmiddag weekend bakery, s complimenten wat een fijne site. vraag mijn starter en voordeeg doet het uitstekend. Deeg was ook prima gerezen (pain naturel recept) maar als ik het keer en insnij zakt het behoorlijk uit krijg nog wel een lichte oven rijs maar niet zoals bij jullie. gisteren gebakken in een dutch oven dan wordt het wel hoog maar moet toch ook op een steen lukken ? Bloem van robert beckhoven gebruikt met hoog eiwitgehalte. starter van roggemeel 4 weken oud inmiddels en verdriedubbeld in 2 uur dus lijkt mij prima. Klinkt allemaal volgens het boekje. Insnijden en inzakken dat hebben wij ook. De oven is dus zeer waarschijnlijk de uitdaging. Er zijn wel wat tips die we kunnen geven. Het gaat om hitte en om voldoende stoom. Niet eenvoudig bij de gemiddelde (huishoud) oven. Het is heel belangrijk om de echte temperatuur van je oven te weten om te bepalen of deze wellicht hoger moet om de goede temperatuur voor het brood te halen. Veel ovens zakken ook direct veel in temperatuur als je ook maar even de deur opent (dus zeker niet doen!) De stoom in de oven krijgen en even houden is ook een uitdaging want veel ovens lekken de stoom er snel weer uit, dus je moet genoeg durven te gebruiken. Bakken op een steen in de oven zou kunnen helpen. now that I have cracked it and can produce a decent loaf each week, how much white flour sourdough mother do I use to make 2 loaves at the same time? I currently have 75g mother left after baking which I feed straightaway with 75g each of white bread flour and cold tap water. I repeat this feed on Thursday, which gives me 300g mother to make 1 loaf and 75g left to start the process again. It is really simple, if you make a loaf with flour, water and yeast and you want to make two loaves, you double the quantities. Same with this, if you want to make two loaves just double the amounts and feed 150 / 150 and repeat and use. Thanks for these tips! they have improved my baking and made me buy a precision scale. I do a lot of baking rather intuitively, but since a couple of weeks when I weigh the ingredients I allso weigh a bottle of water and the bag of flour, This way I can pour in some water or add a bit of flour when I feel like it, and be able to repeat a success. (at the moment I am experimenting with pork fat in wholemeal dough, I started with 70% hydratation, but while mixing I had the feeling I could use a bit more water, I weighed the bottle afterwards and when this bread becomes a success I can start with 72% hydratation next time since I poured exactly 15 grams of water extra. For us, to get consistent results, we cannot do without scales. Especially with salt and yeast, even small amounts can make a big difference. Thank you for this marvelous tutorial. It is extremely motivating and I can’t wait to start! I do get very important facts about bakery thank you. Your site is helps the beginner much. Thank you very much mr Salur, we appreciate your comment and wish you many happy baking hours! My mother years ago told me the baker’s dozen story…a baker noticed a poor woman with 12 children only bought 12 buns each week…one for each child as that was all the money she had. So, being a kind man as all bakers are, he slipped in an extra one for her and showed that bakers are all good people. I have never heard this story before, thank you for sharing! It very much sounds like my own grandfather who was a very kind and giving baker. Having been born in the Netherlands, I have grown up with such delights as stollen, krentenbrood, Appel beignets and rondos. What a treasure it is to have the recipes here, both in Nederlandse and English for our adult children to re-create! Thank you for the recipes, the baking terminology definitions and clear, precise and concise instructions! Hartelijk bedankt! You are welcom here in this little corner of southern Ontario whenever you visit again! That is so wonderful to read! I know how you can long for exactly those things, surrounded by a hint of nostalgia, thinking about your childhood. Hope our recipes will bring much joy to your family together with stories of Holland and growing up in our small but also rather nice little place on the globe surrounded by water. Thank you for the invitation and do drop us a line too if you ever visit Holland. Happy baking and sharing in Ontario! This is an amazing site! Thank you! Glad you like it Slim! Nu is mijn vraag… Kan ik als ik de croissants s avonds vorm, dat ik ze in de koelkast zet en dan de volgende ochtend laat rijzen en afbakken? Of moet dit in 1 handeling achter elkaar door? Of vormen, rijzen en dan koelkast in? Alvast bedankt voor een reactie! Heel goed te horen en die complimenten moet je gewoon tot je nemen! Ja, je kunt de croissants in de koelkast zetten tot de volgende ochtend. Wij doen dit nooit, mede door gebrek aan koelkastruimte, dus onze ervaring is beperkt, maar er zijn veel bakkers die dit doen of de vriezer gebruiken. Het deeg zal heel beperkt verder rijzen in de kou en de boter zal stollen, dus je moet er echt rekening mee houden dat je croissants de volgende ochtend uit de koelkast nog een (flink) aantal uurtjes nodig hebben om op temperatuur te komen en tot de perfecte ‘wobble’ te rijzen. Wij zouden kortom voor je eerste suggestie gaan, omdat je dan meer controle hebt over het rijsproces. 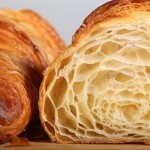 Succes ermee en happy croissant baking! Number twelve is a good one to always keep in mind. Whether or not it’s the first batch, you should never get discouraged if one batch comes out badly. When you don’t succeed you just try again. Hopefully your start up bakeries will do great, it is always nice when a new one comes out. They all have their own unique tastes and flares! 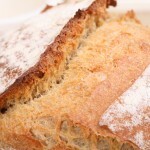 I am enjoying your website especially since I started teaching a bread course. You are very helpful. This baking tip is really going to help me as I recently started baking. Thank you for shaing this. Going to grab some tips from this for sure. Any particular scale you can recommend? We start baking with a Soehnle Optica scale, which is a nice flat scale with big numbers and a relative large area. We now use a professional OHause Valor 2000W scale, however these cost a lot more. Both work perfectly, however the OHaus beats the Soehnle in area size, speed and accuracy. Happy baking!